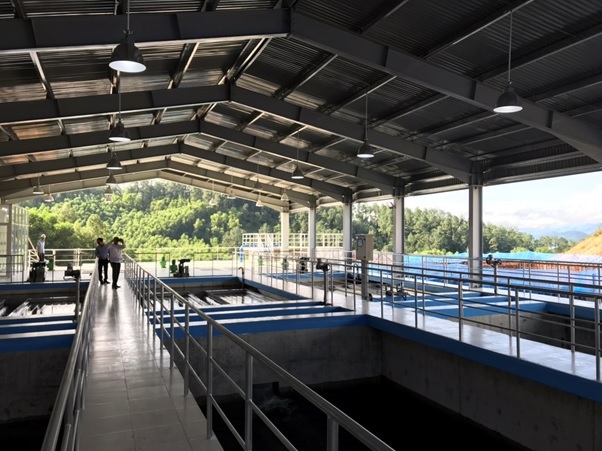 TAM KY, Vietnam – The Phu Ninh Water Treatment Plan in the central province of Quang Nam, Vietnam was officially inaugurated on December 1, with the initial capacity of 50,000 cubic meters per day. The water treatment plant will supply water to the Chu Lai Open Economic Zone, districts of Duy Xuyên, Thăng Bình and Núi Thành, and Tam Kỳ City. The need for quality water in the coming years due to the continued construction of industrial parks and growth of tourism will place substantial expectations on this project. Synergy amongst shareholders will be key for the development of the Chu Lai Economic Zone to succeed. Chu Lai has been uniquely positioned by the Vietnamese government as a priority economic zone for industrial manufacturing. The plant was constructed through the investment of the Phú Ninh Water Treatment Plant Joint Stock Company under the Build-Own-Operate (BOO) model. Total investment is expected to be more than VNĐ1.2 trillion (US$51.1 million) to reach the full capacity of 300,000 cu.m per day by 2025. In May this year, MPW acquired 45 per cent of the BOO Phú Ninh Water Treatment Plant Joint Stock Company. This is the first foray of MPW in the Asian water market and is expected to expand further to bring more water to Asian communities. In June 2018, MPW also acquired 49% of Tuan Loc Water Resources Investment which holds contracts with several water treatment plants in Central Vietnam.